When a Bernie Sanders supporter took an SKS to a baseball park to shoot Republican lawmakers, I feared we were watching the first act in a possible civil war. It was terrifying in a lot of ways, but I suspect none of us were as scared as Rep. Steve Scalise. After all, most of us were reading about it on the internet or watching it on TV. He was laying there on the field, bleeding from gunshot wounds he sustained from the attack. 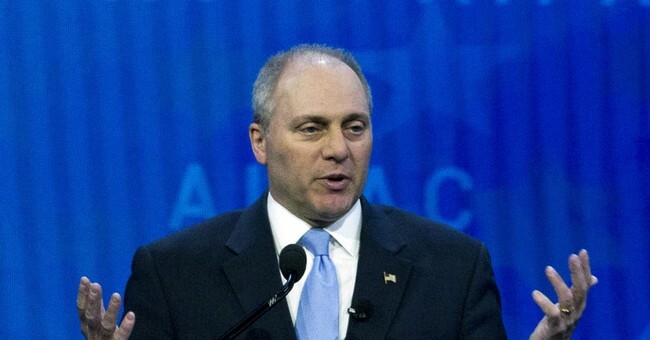 When he recovered, some might have wondered if Scalise’s pro-gun stance had changed. To his credit, though, he remained consistent in his support for the Second Amendment, despite what happened. However, it looks like a senior editor for Raw Story is, well, let’s just say he’s less than appreciative of Scalise’s consistency on the issue. A senior editor of the left-wing website The Raw Story is facing blowback from conservative Twitter after he said House Majority Whip Steve Scalise deserved a “Darwin Award” for continuing to oppose gun control policies despite almost dying from a mass shooting last summer. Martin Cizmar, a former Daily News-Record reporter who now covers politics for The Raw Story, started his rant against Mr. Scalise after the Republican congressman denounced the “vicious threats” sent to senators and their families after confirming Justice Brett M. Kavanaugh to the Supreme Court on Saturday. After facing backlash for the tweet, Mr. Cizmar suggested that Mr. Scalise — an avid Second Amendment proponent who almost died last June when he was gunned down by a leftist gunman at a GOP congressional baseball practice — didn’t deserve any sympathy because he supported the gun policies that contributed to his injuries. To all the unhinged wingnuts angry about my calling a whiny Republic man a little baby… do you support gun control? If so, please keep talking. If not, why do I care about some guy grazed by a bullet who allows children to die because of his dumb and extremist policies? Mr. Cizmar then declared that Mr. Scalise deserved to be nominated for a “Darwin Award,” a satirical award for people who contribute to human evolution by killing themselves off in an embarrassing or ironic way. “When a politician opposes all reasonable gun control and gets shot he deserves a Darwin award nomination not a sympathy card,” he wrote. Mr. Cizmar spent several hours Monday defending himself from Twitter users who accused him of victim-shaming. He didn’t appear fazed by the criticism. And people wonder why we can’t have nice things. Look, I get that Cizmar believes gun control is the way to stop attacks like that, but what we see here is the myopic nature of the anti-gun left. They can’t fathom that someone might oppose gun control yet still want to stop these attacks. The truth is, we all want to see an end to mass shootings. The only people I can imagine who don’t are mass shooters! But that doesn’t mean inhibiting law-abiding Americans from buying and owning guns is the way. It’s worth noting that the shooter in that incident was an Illinois resident, which means he had to navigate all the gun laws in that state to purchase his firearm. He had a gun permit, folks, and let’s be frank for a moment. If he got a gun under Illinois gun laws, what proposal is being offered that would have stopped Scalise from being shot? So maybe it’s not that hard to see why Scalise isn’t clamoring for gun control. Maybe it’s easy to see why he didn’t turn into another Gabby Giffords, someone who won their office on gun owners then did an about-face the moment something horrific happened. Unlike Cizmar, I actually respect Scalise more because he stood his ground after being shot. It would have been easy to go anti-gun. Frankly, a lot of people wouldn’t have blamed him. However, Scalise’s consistency on the issue leads me to believe that of all our allies in Congress, none are as reliable as Steve Scalise. As it stands, the only ones who deserve anything akin to the Darwin Award are Cizmar’s parents, and that’s only for an award that does the opposite. It’s clear they did their part to pollute the gene pool.